One of the easiest ways I market my blog is through email. Here’s something else that excites me about this tool… it drives traffic to your blog! WiseStamp is responsible for 6% of the traffic that came to my blog in the month of January. To put that into perspective, this exceeds the overall traffic The Deliberate Mom has gotten from The Huffington Post and Twitter! Every blogger should have business cards. Make sure your business cards are eye-catching and stand out from the rest. I adore my mini business cards from Moo. They’re affordable and they’re printed on a high quality laminate paper. By the way, if you use my referral link, you get 10% off your first order! Once you have your business cards, make a plan for how you would like to distribute them. Consider placing some business cards in books at your local library or book stores. Choose books that relate to your blogging niche. You can also pin your business card on bulletin boards of places that may relate to your niche (i.e. food blog – local restaurant, parenting blog – indoor playground, etc.). Distribute business cards to local businesses. Make sure to include business cards in any media kits you send to brands you wish to work with. Beyond this, challenge yourself to make at least 1 NEW connection every day. While you’re making connections make sure to respond to generosity, generously. If someone tweets you, thank them! If someone comments on a post, reply to them! If someone pins your content, thank them! Wait? What?! You don’t know what content is being pinned from your site? I encourage you to sign up for pinalerts.com – a FREE service which notifies you of which photos/posts are pinned from your site. You can sign up to be notified: as it happens, once an hour, once a day, or once a week. What I love about this service is you can click the pin’s URL and go directly to the pin on the board of the person who pinned it! Once there, you can like the pin or leave a comment on it. You can also follow that person if you’re not already following them). Did you know that pins with high repin rates and comments are more likely to show up in the Pinterest Smartfeed? So why not help your content along by commenting on the pin and thanking the pinner for pinning it? Admit it, sometimes it’s hard to read review posts. However, I read and comment on review posts of products that I’m especially interested in. I’ve noticed that if I write a thorough and thoughtful comment, the company will often contact me to do a review as well. I’ve had a number of companies approach me because of this strategy. They even mention the post I commented on! So get out there and comment on those reviews!!! I’m still hunting down a good MacBook Pro review to comment on (wink, wink). There you have it! Those were my 5 unique marketing techniques. Are any of these new to you? Is there anything you’re specifically interested in? I would love to hear from you! Want to read more about Blogging? You can follow the Deliberate BLOGGING board on Pinterest right here. 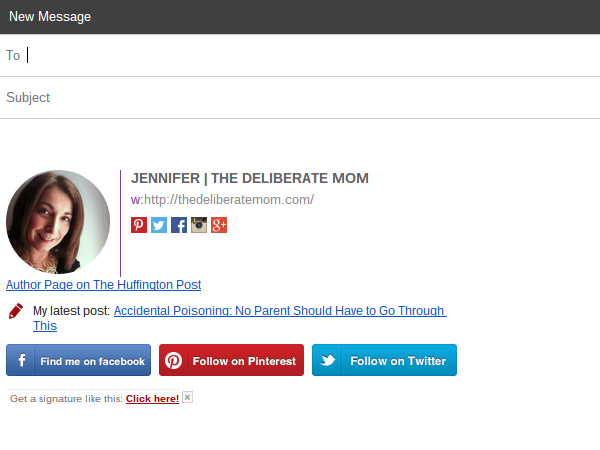 Follow Jennifer | The Deliberate Mom’s board Deliberate BLOGGING on Pinterest. When I started doing reviews I decided I would never do more than one a month. I’ve been doing way less than that. I’m very picky about what I review because I need to love a product before I share it and I feel it needs to be authentic to what our family needs or is experiencing. I want to focus on my writing and content too but even writers need to market themselves. Thank you so much for stopping by Janine. I love my email signature… it’s so awesome! I’m glad this helped you and thanks so much for stopping by! I love the Saturday #SITSsharefest! Great tips! The email signature stat is pretty impressive! I wouldn’t have expected that! I was shocked at the traffic from that email signature. Awesome stuff! Jennifer, thank you for informing me of WiseStamp and PinAlerts! Great post :) Hope you have a wonderful weekend! 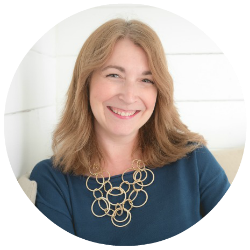 I’m delighted you enjoyed this and that I was able to introduce you to some really great marketing tools! Wow, Jennifer, I learned a lot from this post! I really want to make business cards and my own email signature now. I never would have thought of putting business cards in books at the library. Great idea! I’m so glad that you found this post informative Charlee! The email signature is especially great because it’s FREE! These are such great tips, Jennifer!! I need to set up that email signature, and look into the rest of these great ideas. Thank you!!! I’m so glad you enjoyed this Chris! The email signature is fabulous… and who can argue with free? These are amazing and fantastic tips! I am signing up for PinAlerts now! Thank you! PinAlerts is awesome! I’m certain some people may get freaked and wonder why I go and like their pin after they’ve pinned it. They probably think I’m a stalker LOL. Hi Jennifer, these are fantastic tips! I’m definitely checking out the email signature you suggested. I also agree on taking the time to connect and getting back to comments, tweets or shares. My day can get crazy at times so what I do is write a list of things I need to accomplish before the day ends. I’ve definitely seen some positive results. I actually do a lot of reviews, in fact, my blog is review-heavy and I’m planning to cut down on it or at least spread them out. I’m delighted you enjoyed these tips Donah! Sometimes life gets hectic and it takes me days to reply to comments but I think it’s important to do so. The email signature is fabulous… can’t argue with FREE right?! Thanks Tiffany! I’m loving the class and I’m so happy with the pins I’m creating now! Good Morning! This is an extremely thoughtful and insightful post! Thank you for sharing your inside tricks. I’m already on the link to Wisestamp and I’m so excited to try it. Have a wonderful weekend. I’m delighted you enjoyed this Ashleigh. I hope these tools help you out! Wishing you a lovely weekend as well. You are so very welcome. Free stuff is always awesome stuff! I hope these help you out as much as they helped me! Thank you for sharing. I’m using a couple of those tricks, but I’m off to look at the email suggestions and find some reviews to comment on. I love the WiseStamp email and commenting on reviews is a solid strategy (I receive many review proposals that way). Good luck! We’re traveling today, but I definitely want to check out a few of the links you mentioned here. I’m especially interested in the unique email signature one. These are things I definitely want to keep on my brain as I get more and more comfortable and interested in really growing my blog! I’m so glad you enjoyed this! Yes, the email signature is amazing! You must check it out. I love it when brands contact me because of comments I’ve left… it makes me feel like I must be doing the commenting thing “right”. The WiseStamp e-mail signature is amazing… and it’s free! I’m so glad you enjoyed these tips. I love these tips! I have read so many articles with tips for marketing and I haven’t seen these! I especially like the idea of leaving my business cards in library books…it feels bold yet sneaky, surprising and possibly a help to the reader. I mean, they were looking for something to read related to my blog right? Just got to remember to take a few of my cards to the library next time. I always have my business cards in my wallet so I’m ready to stuff them wherever. Who knows, even if someone doesn’t check out your blog, at least you’ve gifted them with a fine bookmark! I’m delighted you enjoyed this Amanda. I’ve lost track of how many places approach me to do a review based on a comment I’ve left. I have a list of reviews that I need to comment on… MacBook Pro was just one of them LOL. I’m suuuuuuper picky about the reviews I do. Plus, I narrow the competition by only doing paid reviews (unless of course it’s a product I really, desperately want to have… like a MacBook Pro, a Rav4, or an iPhone 6 LOL). I would review a trip to Hawaii for free too *wink*. These are great tips! I had never heard of Pinterest Alerts… I will definitely be checking that out! Leaving business cards in opportune places is a great idea as well! Love it! I love PinterestAlerts – although it makes me feel a wee bit like a stalker when I’m liking the pins that others post from my site. I’m delighted you enjoyed these tips Betsy! I’m so glad you enjoy my blogging posts Ifeoma and I’m delighted you found some of these techniques helpful. Really great tips Jennifer, and lots most don’t know. Might I add if someone tweets or shares one of your posts, make sure to reciprocate and share as well. Not everyone does this but really helps to introduce your audience to others you love as well. It is such a close knit community and so many do want to help. Yes, thank you for adding that Kristen. I will sometimes retweet a tweet but if I’ve already shared that exact tweet just a minute or so prior. Also, if someone has a tweetable link in their post, I make sure to click it… it’s such an easy thing to do and it makes a huge difference! Hi Jennifer! I wrote down the wisestamp address, I”ll have to check it out. I really like your signature stamp! You are always so generous in sharing your wisdom in blogging. You’re amazing :) Where else would I learn about building my blog? I love my WiseStamp signature… it really is fabulous and I can’t argue with something that’s free! I’m glad you enjoy my blogging tips Ceil. These are great! I had never heard of PinAlerts, but I just set up my account! Can’t wait to see how it works. Thanks! I love PinAlerts. It’s so cool to see who is pinning your content! Loooooove these tips! You are such a go-getter, have you made a post yet where you break down your day by the hour? I need to know these things lol…although I feel like you have maybe made a post like that or either told me because I stalk you and ask these things…but if you haven’t, please consider doing so! I want to start being much more intentional with my time. 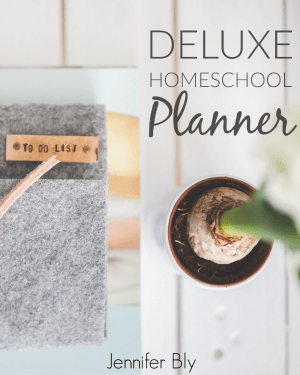 Like YOU, I want to be more deliberate :) Thank you for these ideas, I’m signing up for those pin alerts right now! And I have never thought to make business cards for my blog and leave them in the places you mentioned – so smart! 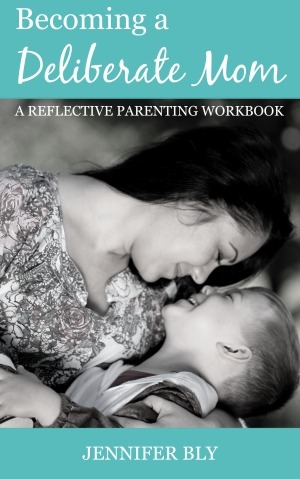 My “day in the life of a homeschooling mom” post was somewhat a breakdown of my day… but I should do a blogging one. Even if no one likes it, I’m assured that you would enjoy something like that. I love my business cards. It’s one of the best blog investments I’ve made. The WiseStamp email signature is wonderful… and I can’t argue with FREE! I’m so delighted you enjoyed these tips Ping. Great tips! 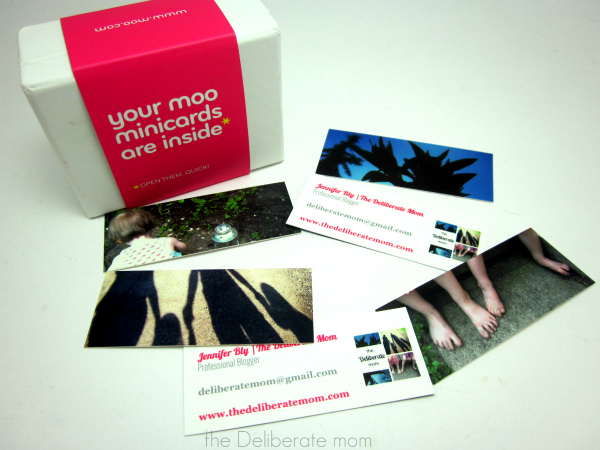 I love moo business cards! Oh, I have to check out the Pinterest alerts. Thanks! Moo is my favourite place for business cards… they never disappoint! The PinAlerts is awesome. Thanks for stopping by! Great tips! I have a basic email signature that I made myself, but that one is so much better! I am definitely going to check into that when I get home.I also have business cards from Moo and they are awesome! I give out the mini ones most of all and they are really high quality. Thanks for all the tips! The WiseStamp email signature is fabulous (I used to have one that I made myself as well but I really like this one)! Aren’t Moo business cards THE best?! I’m glad you enjoyed these tips. Thanks for stopping by Erin. Thanks Jennifer for always bringing the good! I made Pinterest my blog “goal” this year and I’m actually taking a Pinterest class “Pinning Perfect” – which is awesome I might add! I’m glad you enjoyed this Jen. Thanks for stopping by. Hi Jennifer, your blogging tips posts always give me plenty to think about and act on. I will be checking out WiseStamp for sure and Pinalerts for sure. I had considered having cards made, but felt a little daft even considering the idea…I’m not so good at having the confidence to get my blog ‘out there’ (I’m working on it though). I’m delighted you enjoyed this post Debbie… and that it’s given you some things to check out. I’ve definitely got those last three down pat! I don’t have business cards for my blog! I’m a bit embarrassed but I do have them for my photography business and the blog is linked up on that site. It’s still hard sometimes to know whether to connect or separate the two. I imagine that would be challenging to decide where the photography business ends and the blog begins. Thanks for sharing your perspective on these tips! These are fresh ideas I hadn’t heard of yet. Thank you for sharing. I am going to check into the email signature and work on making more connections each day. The email signature is fabulous Emily, I urge you to check it out. Just one new connection every day… it really does grow your blog. Thanks for stopping by and for sharing your thoughts on these 5 marketing techniques. I read this on my phone and just now realized I hadn’t thanked you for your email signature suggestion! I love that email signature… it’s the best! Nice email signature suggestion! Thanks for sharing that one, Jennifer. Very useful! You’re welcome… and the best part, is it’s FREE! What a GREAT LIST!! I have got the email signature from you a little while ago and just signed up for pinalerts for all of my seats! The PinAlerts are fabulous! I love seeing what people are pinning from my site! Great tips! I love Moo! I’m glad you liked these Simone! Aren’t the Moo cards the best?! Holy cow not sure how I missed this post because it’s awesome! 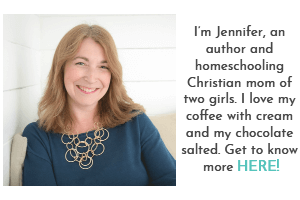 Jennifer you are so knowledgeable about all things blogging and homeschooling and just being awesome. Seriously, really great tips! Thanks so much for reminding me that I need to have business cards printed. I’ve never heard of that company, but I’ll definitely be checking them out. I am so excited to learn about your email signature!!!!! Your email signature has inspired me to create a killer signature of my own, and now that I know how you composed it- it makes it easier for me! Thank you so much! This is an awesome post, Jennifer! I’d never thought about distributing my blog business cards unsolicited. I am going to think of the best places to do this. Also had never heard of pinalerts. Gonna check it out now. 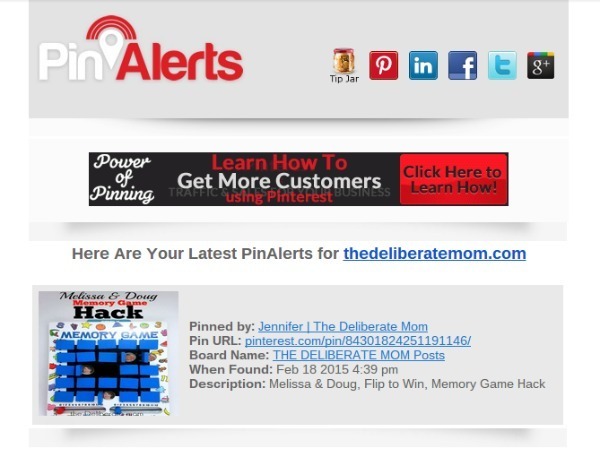 PinAlerts is FABULOUS! I love seeing who’s pinning and then going and liking the pin and/or commenting on it. I’m glad you enjoyed these tips Keisha. More great tips!! Thanks!! I love the business card idea and your business cards look so great. I am going to pause here so you can catch up on reading my comments. You are going to have “80 comments from Cindy” today. ha! ha! Sorry! This is the best way I can keep up with everyone’s blog / comments right now. Also, my son is hungry, so I gotta pause for the cause and feed my little guy! Again, I have missed you and your blog posts. I will read more tomorrow and comment more then too. Big xoxo. I loved designing my business cards and I tried my best to make them stand out from the rest! Sorry I’m so late to respond to this… but better late than never right?! What great tips! I am so thankful for you taking the time to share these with us. I added the email signature and pin alerts to my list- brilliant! Thank you so much! I’m so glad you found these tips helpful Keri! I love the WiseStamp email signature. It’s especially awesome because it’s FREE! I want to do a review of the new MacBook. Have you seen it? They come in gold, too. There are some great ideas. At first my jaw dropped at the 60-interactions. But honestly, between social media updates, scheduling and comments, it really adds up. I’ve never seen the email signature you suggested. It looks great and I’m going to check it out. Thanks. Great advice – I personally wasn’t even aware that there were neither pinterest alerts, nor a better looking email signature. I will use both in the future. Great tips, Jennifer. The first one I’m gonna try is pinalerts — finally a way to see where my pins are ending up. Love this! Pin Alerts is really cool. Sometimes it gets glitchy though and doesn’t email for a day or two and then all of a sudden you get all of your repin notifications. I love seeing where my stuff is being pinned. I love the mini business cards that you have. Such a great idea! Thank you Emilio. I get so many compliments on those cards. I think they really stand out when people see them… they’re memorable! Market your blog through email is a positive way of getting leads as well as a quality traffic. I agree we need to respond generously. All these points are really effective and helpful especially to me. Thank you so much.